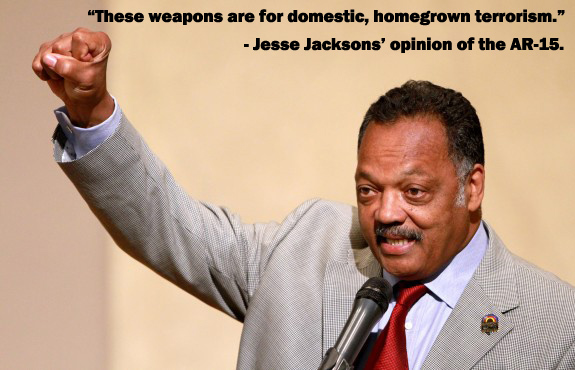 Jesse Jackson has some real intellectual "facts" on "assault rifles". Let's discuss a few of them from a recent article. Sigh. "An assault weapon is not useful for hunting game. It isn't easily available, like a handgun, for self-defense. It is designed for one purpose: war. These are weapons for domestic, homegrown terrorism. Aurora is close to Denver International Airport. A gunman at the end of a runway could shoot bullets through an airplane." Why does this man still speak publicly? Talk about needing a mental health evaluation. Lets break the above paragraph down. "An assault weapon is not useful for hunting game." - Wait what? I can't hunt a deer because my rifle is black? If it was white (Jesse isn't too fond of the white folk) I would better understand Jesse Jacksons' point. Tell Remington and the other manufacturers who specifically market hunting AR's that they won't work on a Bambi. "It isn't easily available, like a handgun, for self-defense." - Ummm. So at the moment this is true. 2 months ago before all the anti-gun nonsense you could find an AR-15 in Walmart. It doesn't get any easier than that to find a rifle. "It is designed for one purpose: war." - Thanks Jesse but last time I checked not one troop in Afghanistan was issued a Rock River Arms AR-15. "These are weapons for domestic, homegrown terrorism." - Sure. Remember all those Bushmaster ads featuring Osama Bin Laden. Man those ads sold soooo many rifles! "A gunman at the end of a runway could shoot bullets through an airplane." - Yep. The AR-15 shoots the infamous "plane killing unicorn bullets" that pierce the hull and then proceed to heet seek every small child on the plane. Click here to facepalm even more.